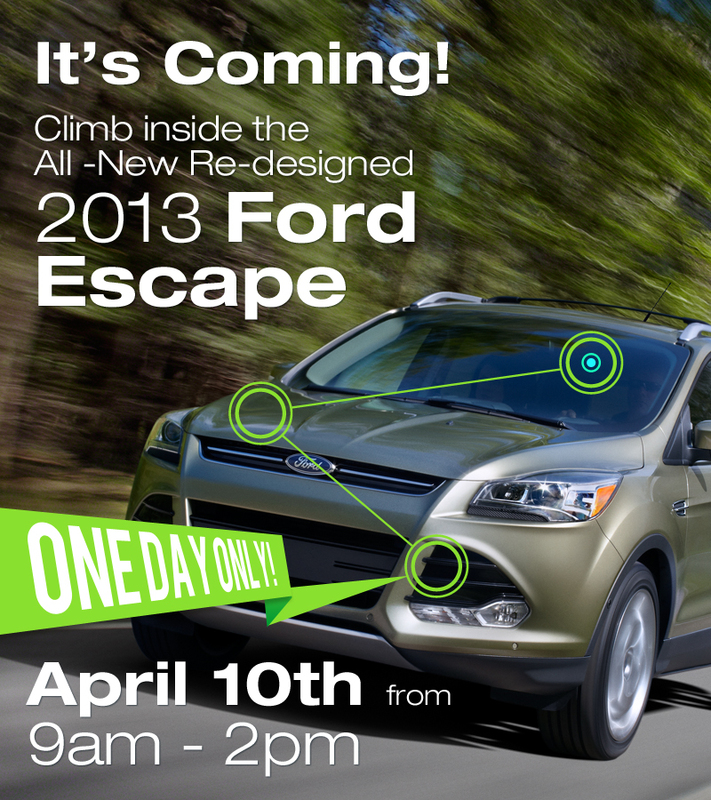 We have the new 2013 Ford Escape in our showroom for you to come and preview before it hits our lot early this summer! The new 2013 Escape is incredible! It offers everything you could want in your Ford and more! The 2013 Escape has intelligent 4-wheel drive and the driver display will show you how the power is being transferred between each wheel. With the new and improved MyFord Touch and SYNC technology the Escape has all of your media controls, navigation, climate settings, hands free phone control, and vehicle information at just the push of a button and a simple voice command. New technology features - the hands free lift gate is something everyone can enjoy, as long as the intelligent key is in your pocket all you have to do is make a gentle kick motion underneath the bumper and just like that the trunk pops open - perfect if you have your hands full and can't get to your keys. The intelligent key also makes locking and unlocking the new Escape easier than ever. With a slide of your thumb on the driver side door handle the Escape locks, pull the handle and it unlocks. We heard many people say they did not like the new look of the redesigned Ford Escape, but the pictures and videos from auto shows do not do justice to the vehicles look. Once you see the new Escape for yourself, you will agree the new 2013 Escape looks great. With EcoBoost drivers can improve fuel-economy without sacrificing power. You can still get 240 horsepower and 270 lb-ft. of torque giving you up to 3500 lbs of towing capacity - plenty of power to get your boat out to the lake. The Easy-Fuel system is great for mess free fill-ups at the pump. 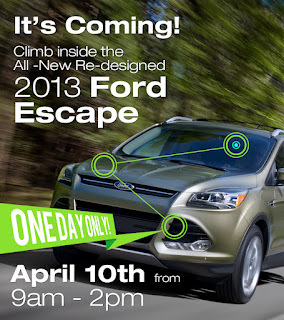 Hurry in to Brighton Ford, the Escape will be here until 2:00 PM today! Brighton Ford is located at 8240 Grand River Ave. just north of I-96 in Brighton. We are a family owned and operated business that strives on customer satisfaction. Brighton Ford proudly serves the Brighton Ford dealership needs, Howell Ford dealership needs, Fowlerville Ford dealership needs, South Lyon Ford dealership needs, Whitmore Lake Ford dealership needs, and Ann Arbor Ford dealership needs, For more information on Brighton Ford, visit BrightonFord.com or give us a call at (800)-836-8206.